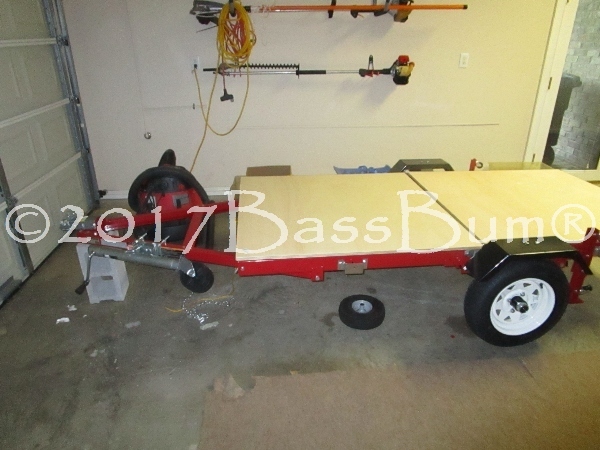 A kayak trailer built from a Harbor Freight utility trailer kit, as seen above before conversion and below after conversion, is a great way to transport your heavy fishing kayak and eliminate back strain or injury that might result from lifting it overhead. 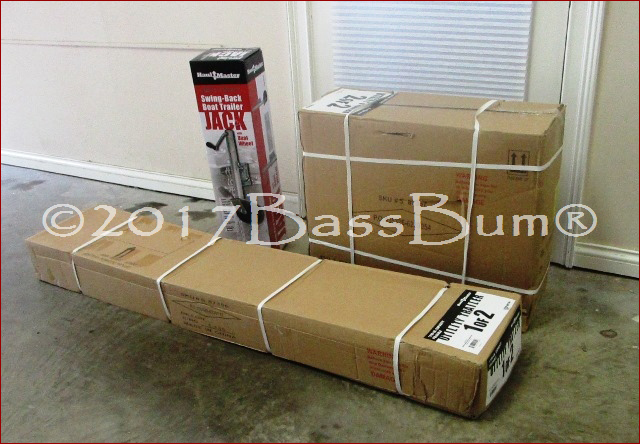 Because sit-on-top fishing kayaks tend to be a bit heavier than other styles, weighing as much as 80-100 lbs, lifting them to the top of your car or SUV should be avoided. 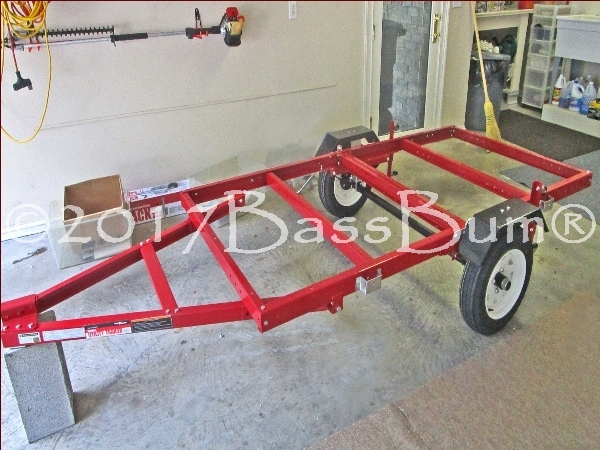 Small boat trailers built by modifying 5' x 8' trailers available from Harbor Freight or Northern Tool, are an efficient, effective and safe way to transport a fishing kayak. I chose the foldable model thinking that feature would help when I needed to store it. Since I've had it, more than a year, I've never folded it once. If I had to do it again I would opt for the non-foldable version as I keep it outside in my drive turnaround with a tarp over it. 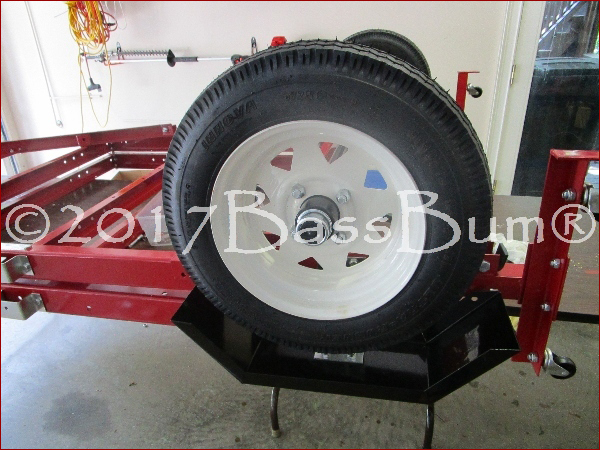 This article is not intended to provide a step by step explanation of how a utility trailer kit is assembled. 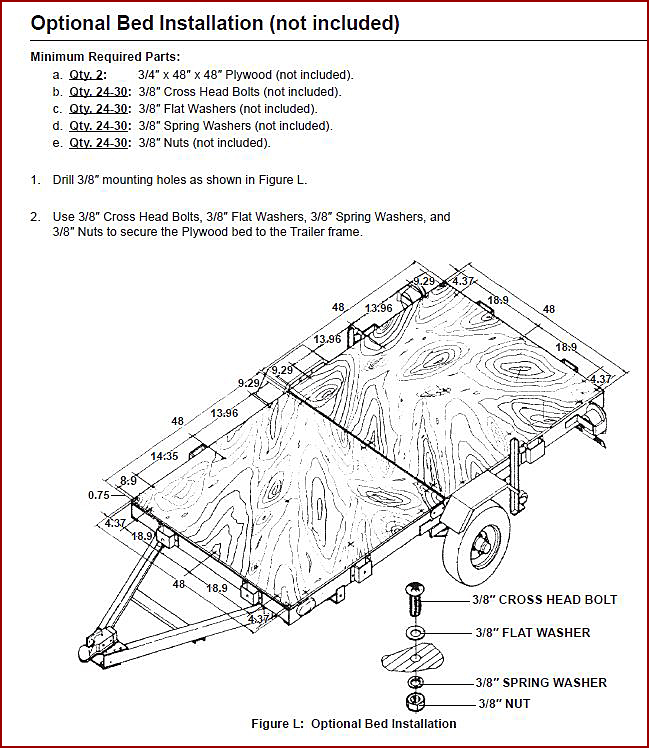 A detailed instruction manual comes with the trailer and is also available on line. I'm not much of a handyman but had no trouble with assembly. Just followed the instructions. It's a good idea to download it as the kit and manual are not an exact match. No serious discrepancies but you may find a few small differences. 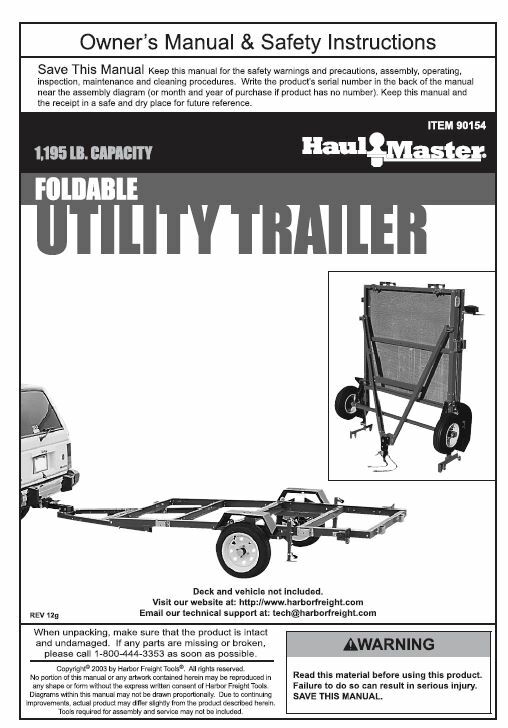 I purchased my Harbor Freight utility trailer, Haulmaster 90154, on sale for $285. It came in the two cardboard boxes seen below. It weighed approximately 250 lbs. 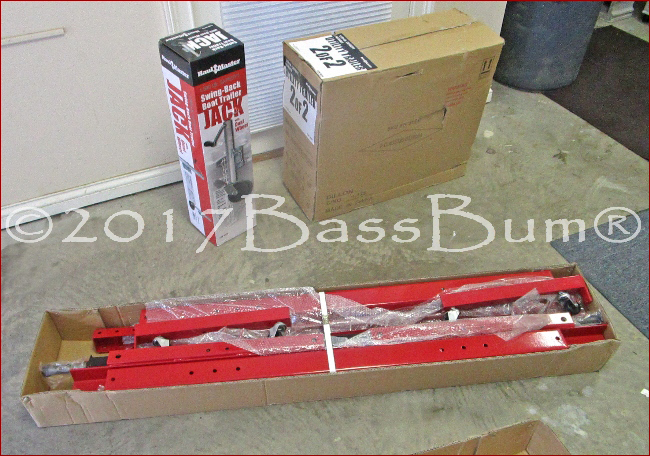 The third box shown in the pictures contained a trailer jack and was a separate purchase. 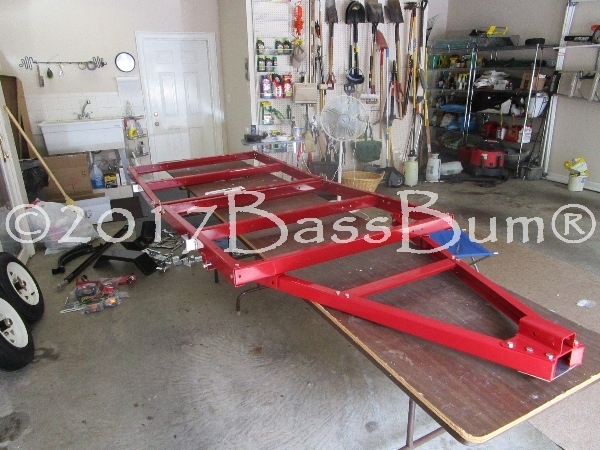 Additionally, folding the trailer after assembly is tricky requiring a few tools and two people to eliminate the possibility of hurting yourself. 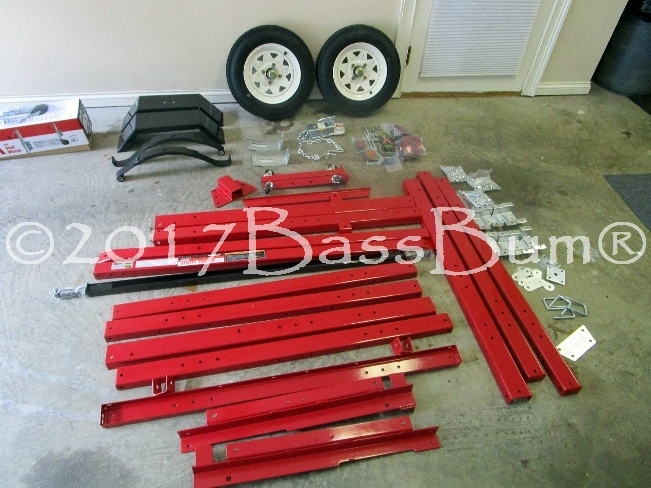 I removed the numerous parts from the boxes and laid them out along with the tools I would need. 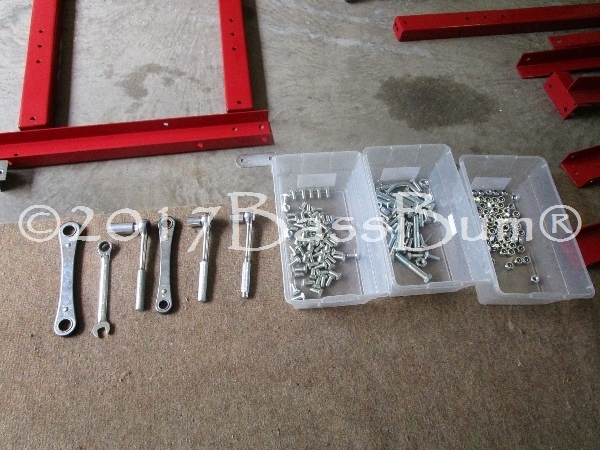 The kit contains 95 various size bolts, most 3/8" and 3/4" in length, and 109 nylon, hex, lug and castle nuts. There is a universal truth that applies to almost anything we do, 'it's all about the tools'. 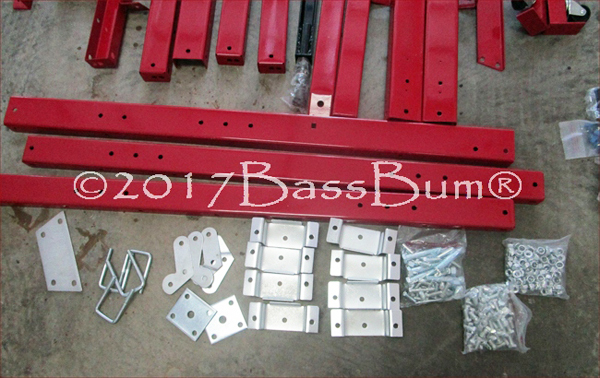 Assembly will go easier if you make sure you have the right tools and correct size bolts and screws easily at hand. 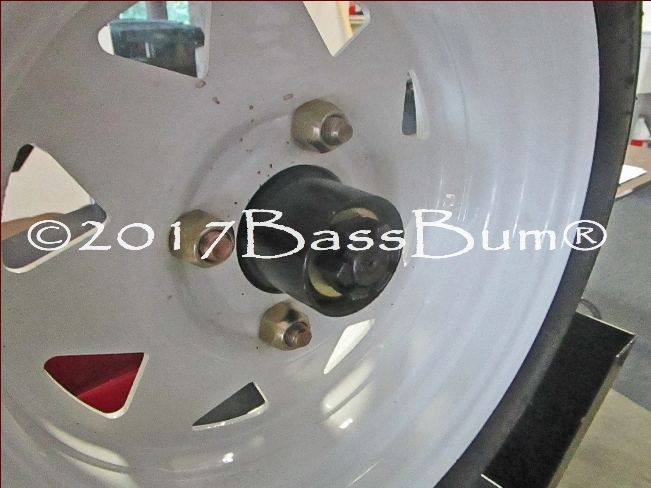 Plan on having a 5/8" socket wrench with an extension available and a 11/16" wrench. 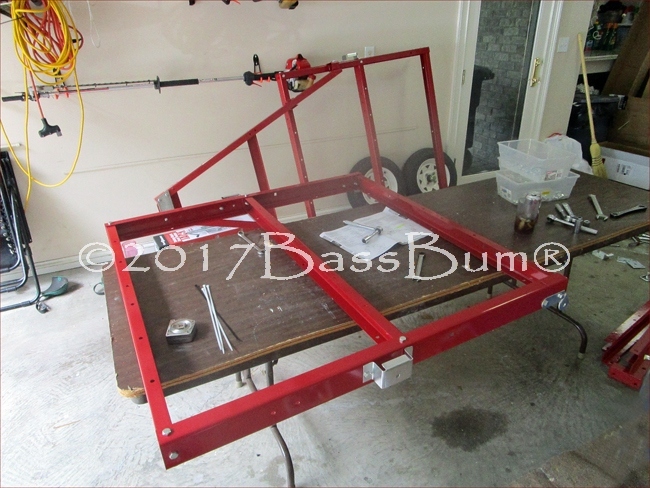 I chose to use a table as a platform for assembling my trailer. Easier than doing so on your hands and knees on the floor. 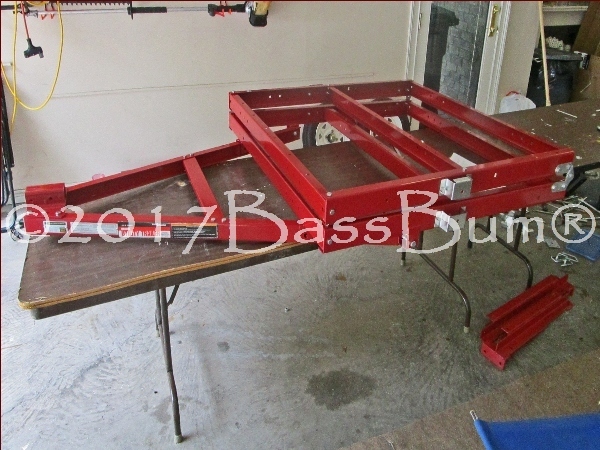 It was an old used folding table I had purchased from Office Depot. Make Sure the Bed is Square! 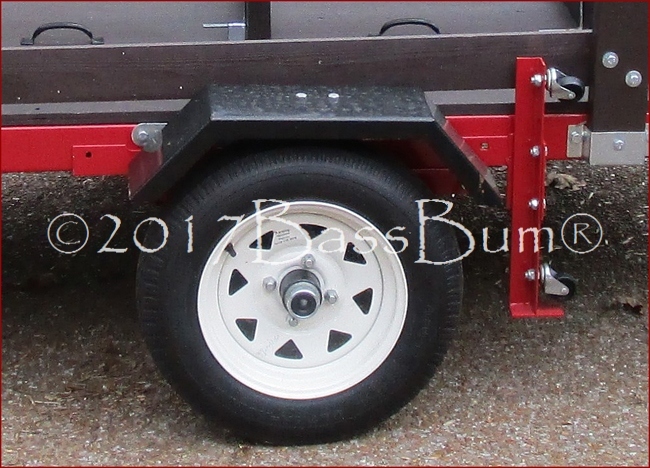 The hub, bearings and wheel unit are the foundation of the trailer. Don't scrimp on quality. 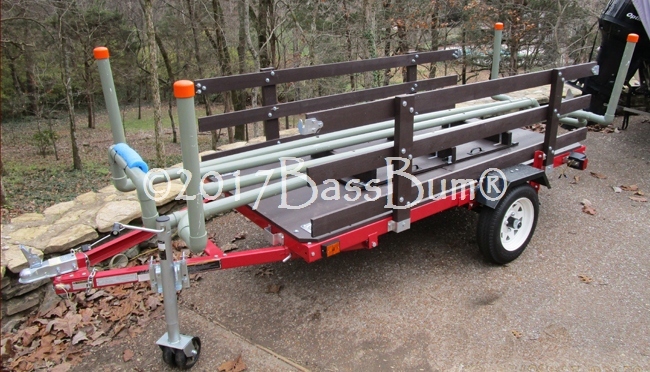 If something fails while towing the trailer it will be here. 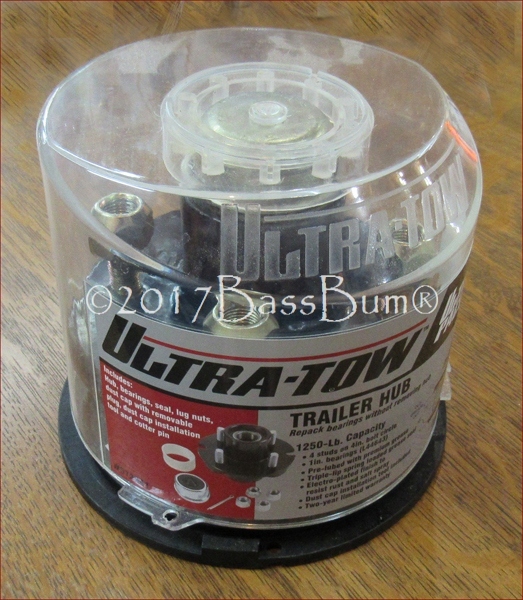 I chose to use a higher quality hub and bearing unit, which I purchased at Northern Tools, than what came with the kit. The units were Ultra-Tow seen to the left. 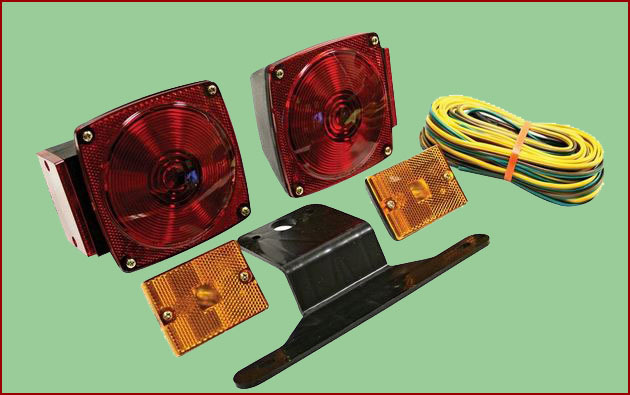 The light set that shipped with the kit, shown in the photograph below, seemed to be of inferior quality. 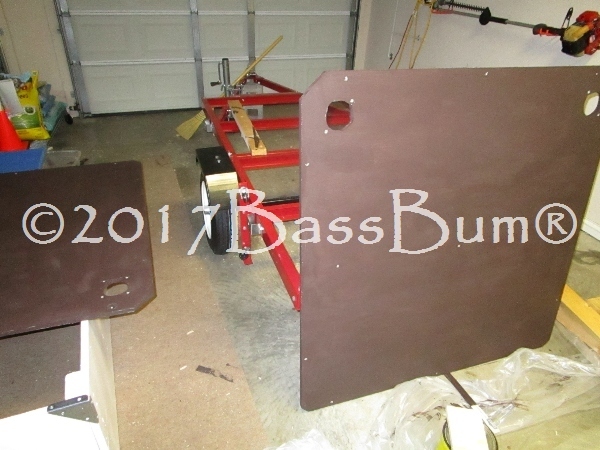 Consequently, I purchased a bit higher quality light kit sold by Reese TowPower, item #73832. I've had no trouble with them a year later. 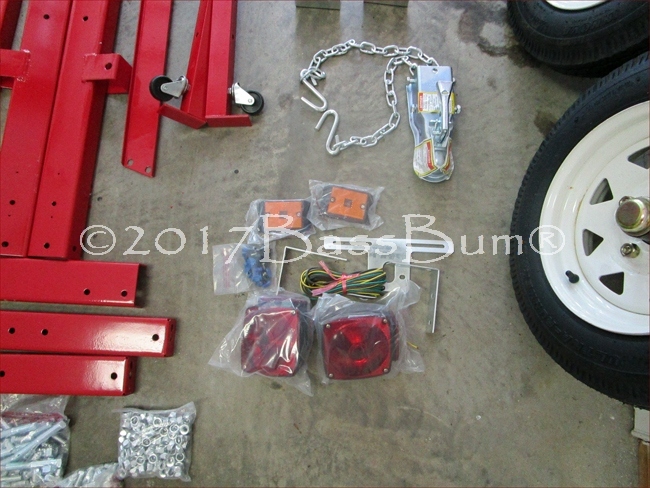 The kit includes a boat trailer wiring diagram that is handy and easy to follow. 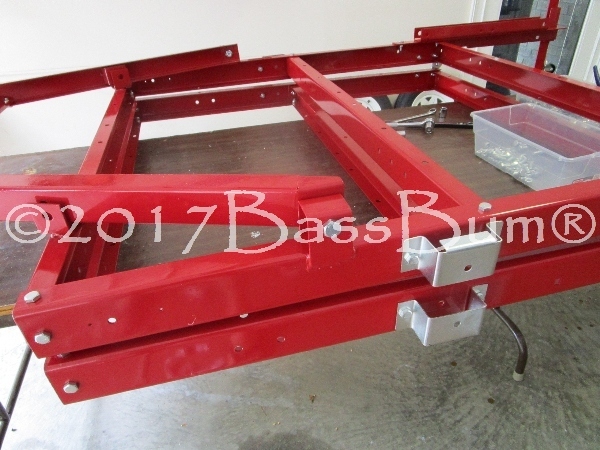 The kit does not include the materials needed to install a trailer floor though it comes with some good instructions and materials list. 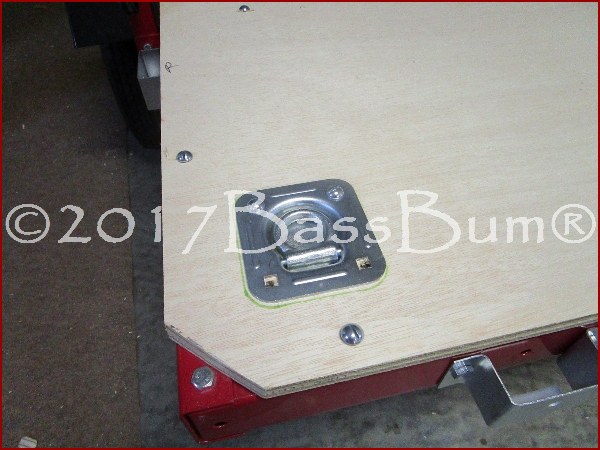 For the trailer floor I chose 3/4" high grade plywood and painted it with Cabot deck stain. Bought some heavy duty tie down anchors from Home depot. 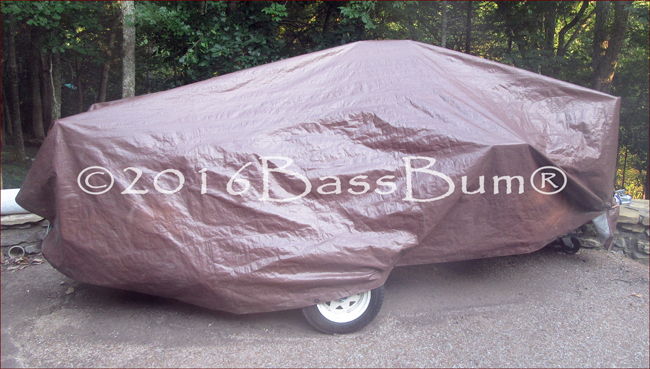 I decided to store the trailer outside covered with a tarp. 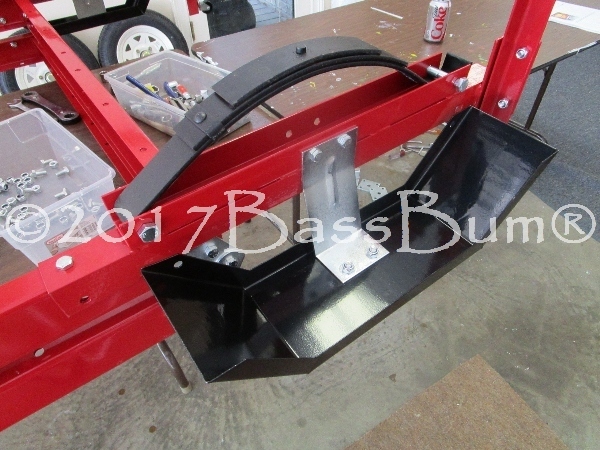 Not pretty but works great and is inexpensive.